By: Dr. Ronald W. McKay, Sr. This book disseminates information, which is based on a study that raised important issues about the effect of No Child Left Behind on the practices of elementary school principals. Some of the issues raised from the study were the modification or reduction of the elementary school principal’s role as instructional leader, the adverse effect on their school vision, the effect on staff morale and the impediment to administrative task, as they try to fulfill NCLB objectives. 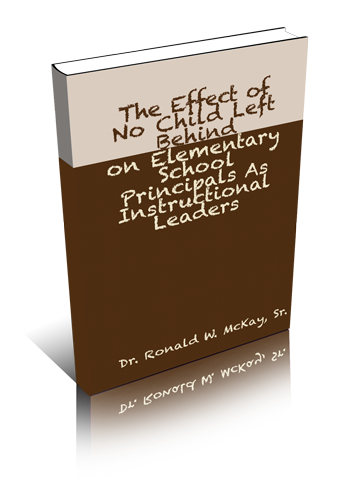 The author felt that it would be important to reveal these issues to inform and educate educators, researchers and the public in understanding the leadership practice employed by the elementary school principal and the effect of these practices by NCLB. The author overall intent in writing this book was to establish a knowledge base, which will help elementary school principals understand their role as instructional leaders, while providing the potential to increase student academic achievement as they further NCLB accountability efforts.